Geo-Solutions completed this award winning project at an MGP site located along the banks of the Vermillion River in the city of Streator, Illinois. The former MGP facility encompassed approximately three acres within a 15-acre parcel. Boundaries to the site include the Chicago and Alton Railroad right-of-way, residential properties and the Vermillion River. 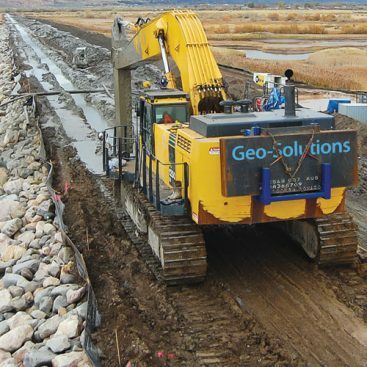 Geo-Solutions was contracted by to provide various site remediation activities at the site as described below. Site preparation included construction of temporary access roads, utility location and protection, installation of decontamination and stockpile areas, and demolition of subsurface structures. Approximately three acres of heavily forested areas were cleared only after ensuring no siltation of the Vermillion River would occur from runoff. 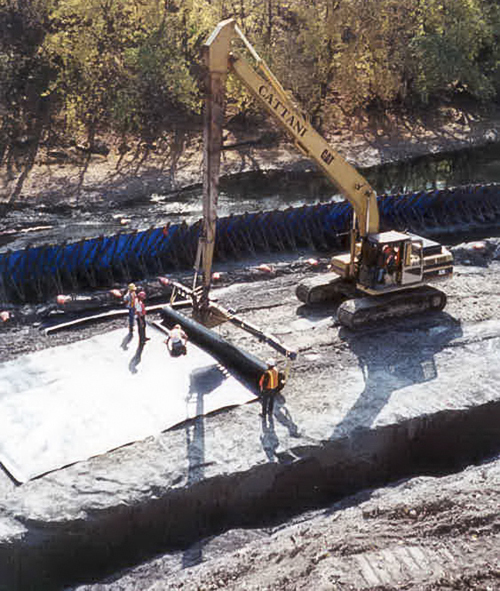 River diversion at the site included installation of a Port-a-Dam system just into the river for a diversion of approximately 650 linear feet. Treatment of site water involved drawing the water down inside the Port-a-Dam and on the work pad area to allow for trenching operations and liner installation. This task was performed with two six inch pumps. The initial de-watering of the Port-a-Dam area was pumped back into the river per USACOE permit. 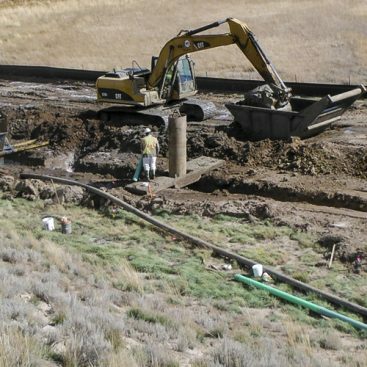 Following this initial stage, water within the diversion dam was pumped to an onsite treatment system consisting of an air sparging unit, bag filtration and granulated activated carbon. Post treatment water was tested for treatment parameters and either discharged to the local POTW or sent for retreatment. Water treatment was performed throughout the project. 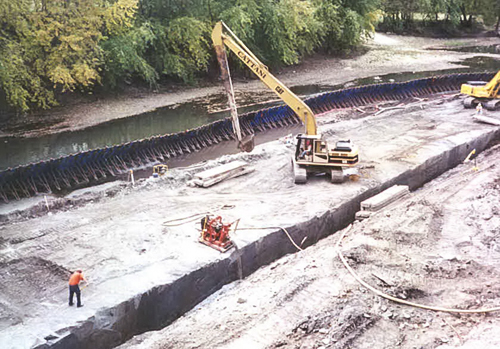 The construction of the recovery trench task involved the installation barrier wall approximately 500 feet long and 20 feet deep to prevent impacted groundwater and NAPL from entering the Vermillion River. The trench was installed entirely through sandstone rock with a key cut into shale utilizing a heavy duty rock trencher. Following excavation by the rock trencher, Geo-Solutions cleaned out the trench utilizing a long reach hydraulic excavator. 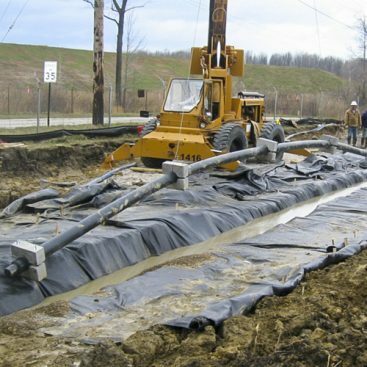 An 80 mil, continuously seamed HDPE barrier wall was installed into the trench in a single lift. A concrete pump with an extended arm was utilized to install a one foot thick concrete plug to seal the bottom of the trench. Approximately 10,000 cy of material were removed using conventional excavation equipment. A three foot thick cover consisting of a HDPE liner and off-site materials including crushed stone, rip-rap, processed stone and sand were placed on the bank after the soil and rock were excavated and the desired grade achieved. The area above the bank was brought to final grade and covered with clean material. A permanent ground water collection system was run from the recovery well and sumps to the water treatment system. The installation was constructed below the three foot cover on the slope of the river bank to the plant. Placement of water treatment plumbing and systems. Achievement of a stable sand matrix placed at the optimum position to intersect groundwater.